The easiest way to get locked up in China! China will soon become the latest country to ban mocking of its national anthem. Well, that’s not entirely true. You will still be free to change the lyrics to make a satirical point, and you’ll also still be free to boo it – you’ll just have to deal with 15 days in prison afterwards! The country’s politicians are discussing draft legislation to control performances of March of the Volunteers, which includes banning it at funerals. Two years ago, they banned it from weddings. Who on earth would want to play their national anthem at their funeral? Apparently one lawmaker even wants to ban people putting their hand on their heart when the anthem’s played, as it looks too American. Is this just a silly news story for everyone to laugh at for a couple of days, then quickly forget? Unfortunately not, as it will have an immediate impact, especially in Hong Kong where football fans have regularly booed the anthem at international matches. Would they dare do that now if they face 15 days in prison? 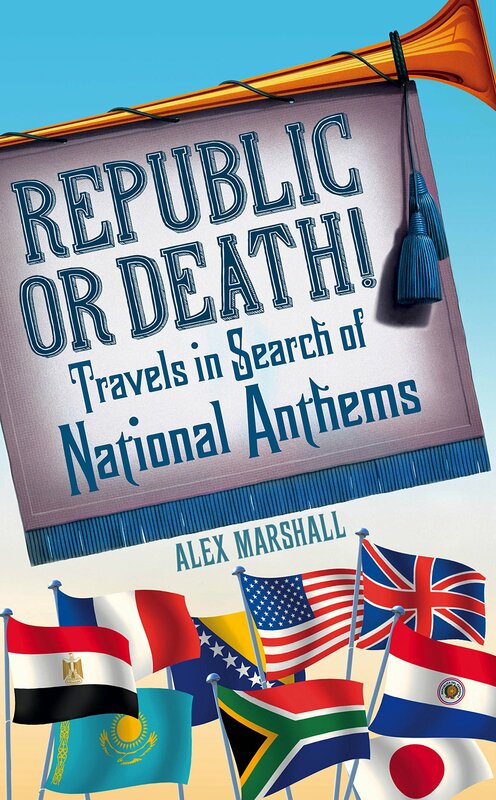 Changing anthem lyrics is also one of the easiest ways to make a political point – read my book, and you’ll find examples of it done everywhere from South Africa to Uruguay – and I guess that outlet will now disappear in the country. Sometimes a silly news story is actually a lot more important. The world’s most terrifying national anthem is under threat! This is Mauritania’s national anthem. Yes, it makes Mauritania sound terrifying – the sort of country that if you ever visited, you wouldn’t escape. It’s more suitable for the Death Star than an African country. Which is why it’s fantastic and why it’s worrying to hear it might be changed. The country’s president, Mohamed Ould Abdel Aziz, is in the middle of altering Mauritania’s constitution, I assume so he can rule FOREVER. As part of this, he also wants to change Mauritania’s national symbols, primarily adding two red stripes to its green flag for some reason (maybe he likes colour contrasts). So there we go: Mauritania could soon go from having one of the world’s best national anthems, to one of the worst. It could go from having an anthem that calls on all Mauritanians to “walk the path of God and die on it” to one that simply praises their president. Or, er, it could stay as it is. I hope it’s the final option. I may set up a petition! How long until the world’s first AI anthem? If ever a post needed some bad clip art, it was this! I just wrote a piece for the New York Times on A.I. music: the companies making it and its potential implications. You can read it here. It’s a strange area to look into as, every moment, you’re stuck between thinking, ‘It’s so cool people are working on this’, and, ‘What on earth happens if they succeed?’ The questions it raises for music’s future are almost overwhelming. “The reason I like computer music is hopefully it can go beyond what we as humans can,” she added. “That’s the exciting thing. The sad thing is the potential automation and putting musicians out of work. There is one style of music, though, that I think is ripe for A.I. : national anthems. Given there are only a couple of hundred of them, and that most share similar a similar musical style and lyrics, surely someone at Google Brain’s Magenta project or DeepMind could quickly knock out a programme to learn from that source material and write one? It might be an improvement. If you’re a new country looking to get some cheap publicity, it may be worth you contacting some of the companies mentioned in the article! Listen to me on Little Atoms! This isn’t actually the podcast, but click it to be flown right there. The wonder of the internet! Any of you listen to Little Atoms? What do you mean, “No”?!? You should. It’s, like, the best books podcast in the UK and I’m not just saying that because they’ve got me on it this week. If you want to hear me talk about my book and national anthems – covering everything from the Olympics to ISIS’s music – head here or subscribe via a site like iTunes. Although you should also just trawl their website, as on it you can listen to everyone from Jon Ronson to Jonathan Meades talk about their amazing books. Neil Denny, the presenter, interviewed me about 10 minutes after talking to Marcus du Sautoy about his latest book, What We Cannot Know (listen here). He couldn’t find a spare mug for me to drink from, so I used Marcus’. I had a cold for the next week. Make of that what you will. Oh, look out for Little Atoms’ magazine too since it contains original journalism as well as long extracts from their best interviews. And go and see Neil interview Hadley Freeman in London this September as Hadley is hilarious and you are 110% guaranteed to fall in love with her, even though you know she’s happily married with multiple children. Most importantly, me! On Sunday at 2pm, I’ll be revealing everything you need to know about national anthems just in time for Euro 2016 and the Olympics. I’m even going to shoehorn in the EU referendum, which should please Boris Johnson. Or maybe not. Get tickets here. David Quantick, Saturday at 1pm, who is talking the art of swearing. Tickets! If you can’t get into that, at the same time Thurston Moore, once of Sonic Youth, is talking about free jazz. Afterwards, he will presumably dodge your questions about his ex-wife. Tickets for that are here. Sarah Perry. She’s written a great sounding book about Essex, where I’m from. She is apparently one of 2016’s most exciting literary voices. That’s all you need to know really, isn’t it? She’s speaking Saturday at 4pm, and it’s free. Details are here. Hadley Freeman, the hilarious journalist, is being hilarious about ’80s movies Sunday at 5pm. If you’d like to get a ticket, you know what to do. And finally, at 6pm on Sunday, David Mitchell – DAVID MITCHELL! – is talking all his amazing books. I probably shouldn’t go as I’m a bit obsessed – if you and I were ever to go out, I’d give you a copy of his book Black Swan Green – but you should. Tickets are at that link!